When running the cppcheck plugin, it will process successfully the .xml file (displays "Cppcheck: 494 errors." in the build, error list works nice). I run into same issue. Option under the second Advanced button are all checked. First time after changing configuration, the trend was showing historical data. The trend information disappeared after a new build finished. The cpp check plugin shows tabular information with a few cpp check findings. It actually looks fine now ... I don't know what happened. jan_ruzicka added a comment - 2012-11-15 21:40 - edited I run into same issue. Option under the second Advanced button are all checked. First time after changing configuration, the trend was showing historical data. The trend information disappeared after a new build finished. 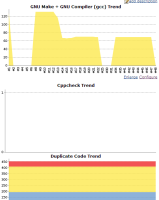 The cpp check plugin shows tabular information with a few cpp check findings. It actually looks fine now ... I don't know what happened. I had the same problem - didn't notice all configurations! I fixed it. Display 'all errors' is now checked by default. Gregory Boissinot added a comment - 2012-11-22 20:59 I fixed it. Display 'all errors' is now checked by default. Michal Turek added a comment - 2014-03-15 14:38 Closing.